Yesterday, NVIDIA officially unveiled its new line of consumer graphics cards: the RTX 20 series. Yes, you heard that right: these will be branded as “RTX” cards rather than “GTX,” thanks to these cards’ use of NVIDIA’s real-time ray-tracing technology, referred to as “NVIDIA RTX.” NVIDIA also claims that they will offer six times the performance of its previous Pascal-based cards and feature all-new GDDR6 memory. 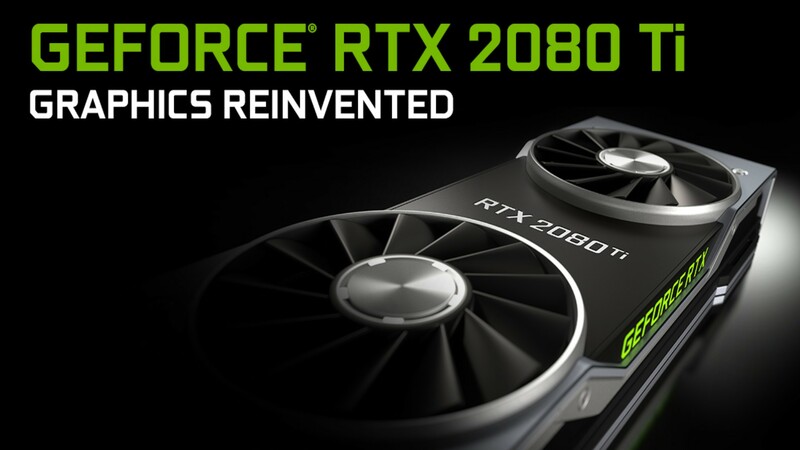 So far, the company has announced the RTX 2070, RTX 2080, and RTX 2080 Ti, all of which will have Founder’s Edition cards available on September 20. In fact, all major third-party partners already have their cards available for pre-order! While it’s safe to assume that we will also see a 2050, 2050 Ti, and 2060 in the near future, those have not been officially revealed just yet. These new Turing-based cards are all focused on ray-tracing, a rendering method that can create incredibly realistic lighting and cinematic effects and which has been long sought after by PC gaming enthusiasts. The overall result will be games that are far more true-to-life than anything previously thought possible, so hopefully this means developers will really start to make use of the new technology in their future projects. RTX 2080 Ti ($999+): The flagship Turing-based gaming card features a whopping 11GB of GDDR6, 4352 CUDA Cores, and a 1635 MHz boost clock. RTX 2080 ($699): The “standard” 2080 model features a full 8GB of GDDR6, 2944 CUDA Cores, and an 1800 MHz boost clock. RTX 2070 ($499): This high-end card still features 8GB of GDDR6, but comes with 2304 CUDA cores and a 1710 MHz boost clock. It’s interesting to note that NVIDIA’s CEO promises that the RTX 2070 is faster than the GTX 1080 Ti in games that use ray-tracing. There have also been recent leaks stating that the unannounced 2060 model would outpace the GTX 1080 at a much lower price point. However, these larger performance gaps might not be quite as big on traditional rasterized titles. So who would these high-end cards be for, exactly? Well, gamers wanting 1440p at high refresh rates (120 or 144 Hz) or a solid 4K at 60 Hz would most likely want to go with the RTX 2070. Those needing to push into the realm of high-refresh 4K would be the ones needing to look into an RTX 2080 or 2080 Ti. Yet, despite the marketing push towards 4K and HDR, the vast majority of PC gamers are still gaming at 1080p, and for those individuals the sweet spot would be in the unannounced 2050, 2050 Ti, or 2060 tier of cards. If the 2060 could outperform the GTX 1080 at a much better price, that would seem to be the real “sweet spot” that a lot of gamers would go after. Now, though, the curtain has finally been lifted. NVIDIA certainly has some impressive cards coming our way next month, but you’re going to have to dig pretty deep in your wallet if you want to afford one of these. However, hopefully we will also see some of the GTX 10 series cards going on sale in light of the new models hitting shelves, giving gamers on a budget who had been holding out on an upgrade some good opportunities to consider. Only time will tell!